The first film was the highest-grossing film of 1985 and became an international phenomenon, leading to the second and third films, which were back-to-back film productions, released in 1989 and 1990, respectively. Though the sequels did not perform quite as well at the box office as the first film, the trilogy remains immensely popular after 30 years and has yielded such spinoffs as an animated television series and a motion-simulation ride at the Universal Studios Theme Parks in Universal City, California; Orlando, Florida; and Osaka, Japan (all now closed), as well as a video game. The film's visual effects were done by Industrial Light and Magic. The trilogy was nominated for five Academy Awards all together, winning one (Best Sound Editing). 5.1 2002 DVD release: "The Complete Trilogy"
5.3 2010 DVD and Blu-ray release: "25th Anniversary Trilogy"
Seventeen-year-old Marty McFly is accidentally sent back in time from 1985 to 1955 in a time machine built from a DeLorean by eccentric scientist Emmett "Doc" Brown, when they are attacked by Libyans from whom Doc stole the plutonium that gives the flux capacitor the 1.21 gigawatts it needs to time-travel. Soon after his arrival in 1955, Marty's mother Lorraine falls in love with him, rather than with his father George McFly, threatening to cause a paradox that would result in Marty ceasing to exist. Without plutonium to power the time machine, Marty must find the 1955 Doc Brown to help him reunite his parents and return to 1985. The efforts of Biff Tannen, George's bully and supervisor, further complicate Marty's situation until Marty successfully causes his parents to fall in love and simultaneously convinces George to finally stand up to Biff. Returning to the future via a lightning strike that powers the machine, Marty discovers a vastly improved situation for the McFly family, as a much more confident George has become an accomplished science-fiction author, and an apparently-softened Biff is now an auto detailer, rather than George's supervisor. Despite 1955 Doc's insistence on not knowing details of the future, a note Marty leaves in his pocket prevents him from being killed by the terrorists. But in the film's final moments, Doc Brown appears in a modified version of the DeLorean and tells Marty and his girlfriend Jennifer Parker that they must travel to the future to fix a problem caused by Marty and Jennifer's kids. The series continues as Doc Brown travels with Marty and Jennifer to the year 2015 where he has discovered Marty's family is in ruins. Shortly after rectifying the situation, Marty buys a sports almanac containing the outcomes of 50 years (1950–2000) worth of sporting events to make easy money. However, Doc talks him out of it and throws the almanac in the bin, where the 2015 Biff Tannen finds it. A sleeping Jennifer has been taken by police to her future home, needing Marty and Doc to retrieve her before returning to 1985. While Marty and Doc are at the 2015 McFly home, 2015 Biff steals the DeLorean time machine and gives the book to his 1955 self just before he goes to the dance at the end of the first film. When Doc and Marty return to 1985, they find that Biff has used the sports almanac's knowledge for financial gain, which allows him to turn Courthouse Square into a 27-story casino, take over Hill Valley, get away with the murder of Marty's father, and later marry Marty's mother. Marty learns that Biff was given the book by 2015 Biff on November 12, 1955, so he and Doc go back to that date in order to steal the almanac from Biff before he can use it to destroy their lives. They accomplish this in a complex fashion, often crossing their own past-selves' paths. When the duo are about to travel back to 1985, a lightning bolt strikes the DeLorean and activates the time circuits, sending Doc back to 1885 and leaving Marty stranded once again in 1955. After finding out that Doc Brown is trapped in 1885, Marty sets out to find the 1955 Doc to help him fix the DeLorean (which has been waiting for him in a mineshaft for seventy years) and restore it to working order. Learning that Doc gets shot in 1885 by Biff's great-grandfather, Buford "Mad Dog" Tannen, Marty travels back in time to save Doc (who has become a blacksmith) and bring him back to the future. Arriving in the middle of a melee between the United States Cavalry and American Indians, Marty is forced to flee to a cave, the uneven terrain tearing the DeLorean's fuel line in the process, emptying the fuel tank and rendering the engine useless. Marty convinces Doc to come back with him and find a way to get back to his time before it's too late. After several dramatic action scenes involving using a speeding locomotive to push the DeLorean to 88 miles per hour (142 km/h), Marty returns to 1985 without Doc Brown. When the DeLorean appears in 1985 on the same train track as planned, a modern train destroys the DeLorean, with Marty jumping out just in the nick of time. Marty reveals to Jennifer the time travel adventure and they visit the scene of the wreckage of the DeLorean. He worries that Doc has been lost in the past forever, when suddenly Doc appears in a new time machine, modeled after a locomotive. When Marty asks if Doc is going to the future, Doc replies that he has "already been there." Doc's last words of wisdom is that nobody knows their future, so they "must make it a good one." The locomotive flies across the sky and disappears, ending the trilogy. Co-writer and director Robert Zemeckis, who has final rights to all films in the Back to the Future franchise, has stated that he will block all attempts to remake or reboot the original film. Co-writer Bob Gale has stated that he did not wish to see another film in the series without the Marty McFly character nor any other actor than Michael J. Fox playing him, while acknowledging that Fox's current health condition would make this impossible. He illustrated this at a 2008 fan convention in Florida, stating "The idea of making another Back to the Future movie without Michael J. Fox--you know, that's like saying, 'I'm going to cook you a steak dinner and I'm going to hold the beef." Gale also said that the Telltale adaptation is the closest thing to what a fourth film could be like. In a USA Today interview on October 21, 2015, the day of Marty McFly's purported arrival in the future, Christopher Lloyd stated that he would consider making a fourth film under the condition that the original cast and creative team returned, along with a story "worth telling". 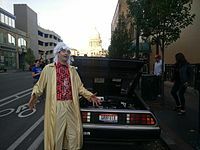 The same day, Lloyd reprised his role as Doc Brown in a brief segment in which Doc Brown returns to announce a special message explaining the discrepancy between reality and the "future" as depicted in the film. Marty McFly and Doc Brown were included in Empire's 100 Greatest Movie Characters of All Time, ranking No. 39 and No. 76 respectively. (A) indicates the adjusted totals based on current ticket prices (by Box Office Mojo). As of June 2011[update], the Back to the Future series is the 14th-highest-grossing trilogy of all time at the domestic market (adjusted for inflation), 17th-highest-grossing trilogy of all time at the domestic market (not adjusted for inflation), and the 13th-highest-grossing trilogy of all time, worldwide (not adjusted for inflation). The trilogy was re-released in certain countries worldwide on October 21, 2015 to commemorate the date travelled to by the protagonists in Back to the Future Part II and generated $4.8 million on its opening day. In the United States and Canada, it earned $1.65 million from ticket sales across 1,815 North American theaters on its opening day. Germany opened with $1.4 million and the United Kingdom with $345,000. Revenues from other territories such as Australia, Austria, France, Italy were moderate. In 1985, MCA Records released the Back to the Future soundtrack. It featured 8 tracks performed by Huey Lewis and the News, Lindsey Buckingham, Eric Clapton, Marvin Berry and the Starlighters, and Etta James. Only two tracks were culled from Alan Silvestri's orchestral score. In 1989, MCA Records released Back to the Future Part II soundtrack with 13 tracks. In 1990, Varèse Sarabande released Back to the Future Part III soundtrack with 18 tracks. In 1999, Varèse Sarabande released Back to the Future trilogy soundtrack with eight tracks from the first film, seven from the second, four from the third, and one from the ride. In 2009, Intrada released a two-CD Back to the Future set as Intrada Special Collection Volume 116. It features the complete original motion picture soundtrack (that is, Alan Silvestri's entire orchestral score) from Back to the Future (Part I) with 24 tracks, 15 tracks of alternate early sessions and one unused source cue from the scoring sessions. 2002 DVD release: "The Complete Trilogy"
In July 1997, Universal Studios announced that Back to the Future would be one of their first ten releases to the new format, though it ended up being delayed for five years. The films were finally released in 3-disc DVD box set on December 17, 2002 in both widescreen and fullscreen. On October 21, 2008, BTTF.com broke the story that Universal will be releasing each of the Back to the Future films individually. The DVDs were released on February 10, 2009 with the first film being a 2-disc set featuring the documentary Looking Back to the Future and Back to the Future: The Ride. 2010 DVD and Blu-ray release: "25th Anniversary Trilogy"
In June 2008, a special screening of the trilogy was held in Celebration, Florida. Bob Gale told the crowd they were seeing the digitally remastered version that was going to be used for the Blu-ray version of the movies. Gale also spoke to potential supplemental features on a Blu-ray version of the trilogy, saying only that never-before-seen bonus materials may appear, though he stopped short of offering any specifics. On June 28, 2010, Universal announced that the Blu-ray edition of the films would be released on October 26, 2010, twenty-five years to the day from the date of the fictional events from the first film. There have been numerous complaints about the R1 packaging, leading to the release of an instruction sheet on how to safely remove and insert discs. Blue with Marty with DeLorean DTS-HD 5.1 Yes Corrected Widescreen ? Tin blue with Marty with DeLorean DTS-HD 5.1 Yes Corrected Widescreen ? - other formats available include Betamax, and MUSE HI-Vision LD. footage that was shot with Eric Stoltz in the role of Marty McFly before he was replaced with Michael J. Fox was not included in Universal's original DVD release in 2002 or in 2009, despite many fans hoping that Universal would include it. Some very brief footage was released in the Blu-ray version in 2010. An animated television series, Back to the Future: The Animated series, lasted two seasons, each featuring 13 episodes, and ran on CBS from September 14, 1991 to December 26, 1992. A comic book series was published by Harvey Comics in 1992 detailing further adventures of the animated series. Only seven issues were produced. IDW is publishing a mini series which presents the first meeting of both Marty and Doc Brown and is written by co-screenwriter Bob Gale, which was released in stores on October 21, 2015, the same date that Marty travels with Doc Brown to the future depicted in the story line for Part II. In issue 3, it was revealed that it had become an ongoing monthly comic due to popular demand. Beginning in issue #6, the original format of one or two untold stories per issue was replaced with a mutli-issue ongoing story arc. The original subtitle for the comic, "Untold Tales and Alternate Timelines", was used for the trade paperback which contained the first five comics in the series. Other series published by IDW include "Citizen Brown", which adapts the Telltale video game, "Biff to the Future", which depicts Biff Tannen's rise to power after being given the almanac by his future self. The latter is also co-written by Gale. The series has now gone on to what IDW calls "chapter 2" of the series with "Tales from the Time Train." This is a series of stories detailing where Doc and the Brown family went after time traveling at the end of Back to the Future Part III. Each film in the trilogy also received a novelization that expanded on the movies by adding scenes, characters and dialog, often culled from early-draft scripts. In 2012, Hasslein Books released A Matter of Time: The Unauthorized Back to the Future Lexicon, written by Rich Handley. The book was released in cooperation with BTTF.com, the official Back to the Future Web site. A second volume, Back in Time: The Unauthorized Back to the Future Chronology, by Greg Mitchell and Rich Handley, was released in 2013. Various video games based on the Back to the Future movies have been released over the years for home video game systems, including the Atari ST, ZX Spectrum, Commodore 64, Master System, Genesis, Nintendo Entertainment System, and Super Famicom platforms. Additionally the game trilogy has also been released for Windows (PC), for Apple (MAC) and for Apple (iPad). The 2015 video game Lego Dimensions features two Back to the Future-themed toy packs. The Level Pack adds a bonus level that adapts the events of the first film, and includes a Marty McFly minifigure, along with a constructible DeLorean and Hoverboard. The Fun Pack includes a Doc Brown minifigure and a constructible Time Train from Part III. Both unlock access to an in-game open world set in Hill Valley. Michael J. Fox and Christopher Lloyd reprise their respective roles. On 31 January 2014, it was announced that a stage musical adaptation of the first film is in production. The show, which will be co-written by original writers Robert Zemeckis and Bob Gale, was expected to premiere in 2015 but got pushed to 2016. According to Gale, the musical will be "true to the spirit of the film without being a slavish remake". The musical is part of the 30th anniversary of the original film. In 2015, Fox and Lloyd starred alongside popular YouTube science personality Go Tech Yourself in an extended Toyota commercial for Toyota's new fuel cell vehicle, the Mirai, entitled Fueled by the Future. The commercial doubled as a tribute to the franchise and illustrated how the idea of converting trash into fuel had become reality. The commercial was released on October 21 — the same date to which Marty, Doc and Jennifer traveled in Back to the Future Part II. Doc Brown Saves the World is a 2015 direct-to-video short film directed by Robert Zemeckis and starring Christopher Lloyd as Emmett Brown. The short is featured on the 2015 Blu-ray and DVD release of the Back to the Future trilogy commemorating for the franchise's 30th anniversary. The short was written by Robert Zemeckis and Bob Gale and produced by Bob Gale and Neil Canton through Amblin Entertainment. Music for the short was performed by Alan Silvestri. The short was released in the United States on October 20, 2015. Emmett Brown is in an undisclosed location outside of Hill Valley, California. He sets a video camera to automatically track his body in order to videotape a message for Marty McFly. He explains that it is October 21, 2015, one hour before Marty, Doc, and Jennifer Parker arrive from 1985. He explains that when he traveled in the future, he discovered that there was a nuclear holocaust that occurred on October 21, 2045. He tracked it down to four inventions: the food hydrator, self lacing shoes, the hoverboard, and the Mr. Fusion home energy reactor. The former three inventions had led to the world becoming lazy and obese, leading to widespread waste. The invention of hoverboards lead to hovercars, which led to people throwing their trash out of the windows, causing a great trash storm in 2021. All of this trash needed to be disposed of, which led to 100 million Mr. Fusion units being manufactured. All of the Mr. Fusion units had a tiny nuclear reactor inside, and all of them detonated on October 21, 2045. The chain of events that led to this happening began less than twenty-four hours after Marty caused Griff Tannen to crash his hoverboard into the Hill Valley Courthouse when Griff is sentenced. He vowed to get back at the world for laughing at him, and planned to do it through a company which he founded, GriffTech. Doc holds up a clear tablet computer with a digital version of the Hill Valley Telegraph. On June 13, 2032, GriffTech invented a social media network called ThingMeme, which had secured funding from Douglas J. Needles. ThingMeme allowed inanimate objects to post selfies on the internet. However, it was a scam, as it allowed Griff to gain access to every object on Earth. On the 30th anniversary of his arrest, on October 21, 2045, he uploaded a virus that was supposed to flash the word butthead on everything. However, it short circuited the Mr. Fusion network, causing nuclear explosions in 100 million homes around the world. Doc Brown then travels to an unknown date to change history so these inventions are never created, which will prevent the nuclear explosion from occurring. He leaves his camera on, which manages to capture the four inventions being erased from history. He arrives back in 2015, in a winter jacket and ski goggles, declaring that the mission was more complicated than he had calculated, but declaring it a success. He holds up the tablet computer, where the headline on the Hill Valley Telegraph changes from "Griff Tannen Founds Grifftech" to "Griff Tannen Found Guilty". Doc's excitement is short lived, however, as he reaches in his pocket. He pulls out the Quantum Mind Jar, which he thought he had disposed of in 2075. He is worried that not doing so will unravel everything they have accomplished. In a female voice, the artificial intelligence of the Quantum Mind Jar tells Brown that they need to go back to the future, which he dismisses as he doesn't want to risk making any more time travel. At that moment, another Emmett Brown, from an unknown time period, arrives, also declaring his experiment a success. Both versions of Brown, along with the artificial intelligence of the Quantum Mind Jar, are shocked at discovering that there are two Emmett Browns present. Back to the Future: The Ride is a simulator ride based on and inspired by the Back to the Future films and is a mini-sequel to 1990's Back to the Future Part III. The original attraction opened on May 2, 1991, at Universal Studios Florida. It also opened on June 2, 1993 at Universal Studios Hollywood and on March 31, 2001 at Universal Studios Japan. The rides in the United States have since been replaced by The Simpsons Ride. The ride in Japan remained operational until May 31, 2016. In the fall of 2015, a Kickstarter project released the Back in Time documentary film. The film features interviews with the members of the cast and crew along with the cultural impact of the trilogy 30 years later. 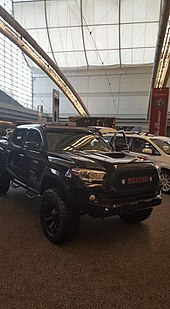 The replica Toyota Tacoma concept based on the original Toyota truck, on display during the Pittsburgh International Auto Show at the David L. Lawrence Convention Center in 2016. October 21, 2015, the date used for the setting of the future events during the first act of the second film, has been called "Back to the Future Day" by the media. The year 2015 also commemorated the 30th anniversary of the release of the original film. Universal Pictures created a trailer for Jaws 19, the fictional 3D film advertised in the future setting. Universal and Mattel produced an advertisement for the hoverboard seen in the film. Pepsi produced a limited run of the "Pepsi Perfect" soft drink, including the unique bottles, which sold out before October 21, 2015. The Ford Motor Company allowed users configuring a Ford Focus on their website to add a Flux Capacitor as a $1.2 million option. Nintendo released the game Wild Gunman, which Marty is seen playing in the Cafe '80s scene, on the Wii U's Virtual Console service. The October 22, 2015 edition of USA Today used a mock-front page which was a recreation of the one seen in the film on that date. The back of the mock page contains an advertisement for Jaws 19, as well as ads for the 30th anniversary Back to the Future box set and The Michael J. Fox Foundation. On the real front page, the USA Today blue dot is replaced with a drone camera like the one seen in the film. The print edition of this edition sold out in record time, according to USA Today. Nike revealed that they had recreated the Nike Mag shoes that Michael J. Fox wears in the film, complete with self-lacing power laces (a 2011 design was based on the same shoes, but lacked the power laces). Although the laces operated more slowly than those seen in the film, they were nonetheless shown to work as intended in an eight-second video featuring Fox wearing the shoes. Pairs of the shoes were sold via auction in 2016 to benefit The Michael J. Fox Foundation for Parkinson's Research. Toyota and Universal Pictures celebrated the 30th anniversary of the film series with a Toyota Tacoma Concept that was inspired by the original 1985 pickup that Toyota created for the 1985 film. The 2016 Tacoma 4WD was recreated using the same features and black color paint trim, KC HiLite driving lamps (modified with LED lighting), modified headlights and taillights (matching the 1985 version), the Toyota badging to the truck's tailgate, as well as the same D-4S fuel injection, the 1985-inspired mudflaps, and customized license plates matching the 2015 vehicles in Part II. The only difference between the 1985 original and the 2016 concept is the tires: Goodyear was featured in the 1985 film, while BF Goodrich is used on the concept. Toyota notes that this is a one-off concept as there are no plans to offer it as a package or level trim. Toyota also produced a promotional video starring Michael J. Fox and Christopher Lloyd and featuring many of the locations depicted in the film series, wherein the Delorean's Mr. Fusion is used as a comparison for Toyota's hydrogen powered Mirai. Universal re-released all three films on DVD and Blu-ray disc on October 21, 2015. Telltale Games re-released their licensed Back to the Future: The Game in a 30th Anniversary edition for newer consoles a week in advance of October 21. Several video games released downloadable content related to Back to the Future to coincide with October 21, 2015, including Rocket League and LittleBigPlanet 3. Cast members appeared on Today and Jimmy Kimmel Live! on October 21, 2015. Nearly 2,000 theaters worldwide showed back-to-back screenings of the Back to the Future trilogy on October 21 and continuing through that weekend, which earned over $4.8M in single day ticket sales. Universal studios offered location tours of the various filming locations around the date. The town of Reston, Virginia, temporarily changed its name to "Hill Valley" to commemorate the series during its annual film festival. Esquire Network aired the trilogy all day that day, plus all weekend. The White House celebrated Back to the Future Day. ^ "Robert Zemeckis rules out Back to the Future remake". The Telegraph. July 1, 2015. Retrieved July 7, 2015. ^ Back to the Future: The Game - 30th Anniversary Edition Trailer. YouTube. September 29, 2015. ^ "Christopher Lloyd couldn't have foreseen this 'Future'". USA Today. October 21, 2015. ^ Universal Pictures Home Entertainment (October 20, 2015). "The Future Is Now! - 10/21/15 - A Special Message From Doc Brown" – via YouTube. ^ "Marty McFly entry on ''100 greatest movie characters''". Empire. December 5, 2006. Retrieved July 1, 2011. ^ "Doc Brown entry on ''100 greatest movie characters". Empire. December 5, 2006. Retrieved July 1, 2011. ^ "Back to the Future (1985)". Box Office Mojo. Retrieved December 4, 2010. ^ "Back to the Future (2010 re-release)". Box Office Mojo. Retrieved October 17, 2014. ^ "Back to the Future (2014 re-issue)". Box Office Mojo. Retrieved October 17, 2014. ^ "Back to the Future Part II (1989)". Box Office Mojo. Retrieved December 4, 2010. ^ "Back to the Future Part II (Foreign gross)". The Numbers. Retrieved December 4, 2010. ^ "Back to the Future Part III (1990)". Box Office Mojo. Retrieved December 4, 2010. ^ "Back to the Future Day (2015)". Box Office Mojo. Retrieved November 3, 2015. ^ "Top Trilogies – Domestic: Adjusted for Ticket Price Inflation". Box Office Mojo. Archived from the original on January 22, 2005. Retrieved July 1, 2011. ^ "All Time Box Office Records: Top Trilogies – Domestic". Box Office Mojo. June 17, 2007. Archived from the original on July 8, 2011. Retrieved July 1, 2011. ^ "Top Grossing Trilogies Worldwide". Box Office Mojo. May 15, 2007. Archived from the original on July 8, 2011. Retrieved July 1, 2011. ^ a b c Pamela McClintock (October 22, 2015). "Box Office: 'Back to the Future' Day Earns $4.8M Worldwide". The Hollywood Reporter. Retrieved October 22, 2015. ^ Anthony D'Alessandro (October 22, 2015). "'Back To The Future' Day Racks Up Dough From Trilogy Re-Release". Deadline Hollywood. Retrieved October 22, 2015. ^ "Back to the Future". Rotten Tomatoes. Retrieved November 9, 2018. ^ "Back to the Future". Metacritic. Retrieved March 10, 2015. ^ "Back to the Future II". Rotten Tomatoes. Retrieved November 9, 2018. ^ "Back to the Future II". Metacritic. Retrieved March 10, 2015. ^ a b "CinemaScore". CinemaScore. Retrieved November 9, 2018. ^ "Back to the Future III". Rotten Tomatoes. Retrieved November 9, 2018. ^ "Back to the Future III". Metacritic. Retrieved March 10, 2015. ^ "Amazon.com: Back to the Future: The Complete Trilogy". Amazon. Retrieved January 25, 2016. ^ Surpless, Brendan (June 3, 2008). "RUMOR: Bob Gale hints "Back to the Future" may be coming to Blu-ray Disc". HighDefDiscNews. Retrieved July 6, 2010. ^ "From Universal Studios Home Entertainment, One of the Biggest Motion Picture Trilogies Comes to Blu-ray for the First Time Ever". California: Prnewswire.com. June 28, 2010. Retrieved July 6, 2010. ^ Shaffer, R.L. (October 25, 2010). "Back to the Future: 25th Anniversary Trilogy Blu-ray Review". IGN. Archived from the original on November 16, 2010. Retrieved December 4, 2010. ^ "How to remove/insert discs" (PDF). IGN. Archived from the original (PDF) on July 13, 2011. Retrieved December 4, 2010. ^ "Sci-fi-Geek-Reference Book-Back to the Future Lexicon-Rich Handley". hassleinbooks.com. Retrieved July 1, 2015. ^ "Back to the Future™". bttf.com. Archived from the original on July 20, 2013. Retrieved July 1, 2015. ^ "Sci-fi-Geek-Reference Book-Greg Mitchell-Rich Handley-Back to the Future Timeline". hassleinbooks.com. Retrieved July 1, 2015. ^ "Telltale Games Back to the Future: The Game". telltalegames.com. Archived from the original on July 1, 2015. Retrieved July 1, 2015. ^ "'Lego Dimensions' reunites the original 'Back to the Future' cast". Retrieved September 16, 2015. ^ "Back to the Future musical announced". BBC News. Retrieved July 1, 2015. ^ "Back In Time". Kickstarter. ^ a b Rosenthal, Phil (October 6, 2015). "'Back to the Future' Day, Oct. 21, 2015: Beyond Cubs, Jaws 19, Pepsi Perfect". Chicago Tribune. Retrieved October 14, 2015. ^ "Back to the Future Day live: Is October 21, 2015 turning out like the film predicted?". Daily Telegraph. October 21, 2015. Retrieved October 21, 2015. ^ "how to enjoy back to the future day". The Independent. October 21, 2015. Retrieved October 21, 2015. ^ "It's 'Back to the Future' Day. How Does the Present Stack Up". The New York Times. October 21, 2015. Retrieved October 21, 2015. ^ "Back To The Future: The Complete History". Empire Magazine. October 21, 2015. Retrieved October 21, 2015. ^ "Back to the Future: Jaws 19 trailer actually released". The Daily Telegraph. October 6, 2015. Retrieved October 14, 2015. ^ Bryant, Jacob (October 5, 2015). "Watch: 'Back to the Future'-Inspired 'Jaws 19' Trailer". Variety. Retrieved October 21, 2016. ^ McAloon, Jonathan (October 13, 2015). "Hoverboard ad released ahead of Back to the Future Day". The Daily Telegraph. Retrieved October 14, 2015. ^ Kooser, Amanda (October 5, 2015). "Pepsi Perfect from 'Back to the Future' gets real this month". CNET. Retrieved October 14, 2015. ^ McFarland, K.C. (October 19, 2015). "Have You Driven a Ford (With a Flux Capacitor) Lately?". Wired. Retrieved October 21, 2015. ^ Kohler, Chris (October 21, 2015). "Nintendo Re-Releases Marty McFly's Favorite Game This Week". Wired. Retrieved October 21, 2015. ^ Kulp, Patrick (October 21, 2015). "USA Today travels 'Back to the Future' with front page from the film". Mashable. Retrieved October 23, 2015. ^ Holub, Christian (October 23, 2015). "Back to the Future edition of USA Today sold out in record time". Entertainment Weekly. Retrieved October 24, 2015. ^ a b c Alexander, Julia (October 21, 2015). "Michael J. Fox shows off real self-lacing shoes in video for Back to the Future Day". Polygon. Vox Media. Retrieved October 21, 2015. ^ Moser, Cassidee (July 16, 2015). "30TH ANNIVERSARY BACK TO THE FUTURE BLU-RAY COLLECTIONS COMING IN OCTOBER". IGN. Retrieved October 22, 2015. ^ Phillips, Tom (September 29, 2015). "It looks like Telltale's Back to the Future will launch on PS4, Xbox One". Eurogamer. Retrieved October 22, 2015. ^ Dunham, Jeremy (October 12, 2015). "Rocket League Goes Back to the Future!". PlayStation Blog. Retrieved October 14, 2015. ^ Isbell, Steven (October 21, 2015). "LittleBigPlanet 3: Back to the Future Arrives Today!". PlayStation Blog. Retrieved October 21, 2015. ^ Dawn, Randee. "See the 'Back to the Future' cast reunite on TODAY". ^ "Fox, Lloyd Go 'Back To The Future' On 'Jimmy Kimmel Live!'". ^ D'Alessandro, Anthony (October 22, 2015). "'Back to the Future' Day Racks Up $4.8M from Trilogy Re-Release – Update". Deadline. Retrieved October 24, 2015. ^ "Great Scott! 'Back to the Future' Day Has Finally Arrived". Newsweek. October 21, 2015. Retrieved October 25, 2015. ^ Bush, Samantha Valtierra (October 20, 2015). "Non-profit We're Going Back hosts 5-day 'Back to the Future' bonanza". Los Angeles Daily News. Retrieved October 25, 2015. ^ "Back to the Future day: live! Enjoy 21 October 2015 around the world". The Guardian. London. October 21, 2015. Retrieved October 21, 2015. Wikivoyage has a travel guide for Back to the Future tourism. Wikimedia Commons has media related to Back to the Future Day.